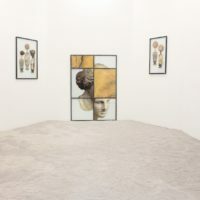 For the Phantom Legacy project, Théo Mercier has decided to tear down the old walls and ceilings of the exhibition halls of the MARSO gallery. The debris lays on the floor in the manner of a ruin. 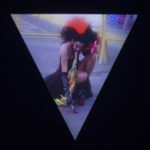 There is something of the history of the place that collapses with this act. The remains of the architectural surface of the interior are thus incorporated into the exhibition. Mercier, who also has a production in the field of performing arts, recognizes the value that certain scenographic resources can have. 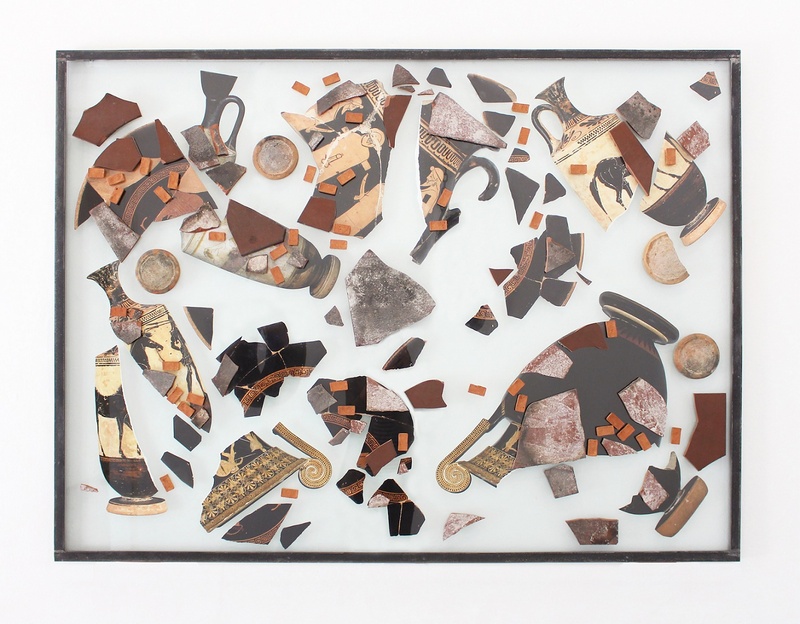 In this case, the rubble —seen as ruins or a kind of stratum—engages in dialogue with the pieces that compose Phantom Legacy, which deal with themes related to history, anthropology, its construction, and destruction as well as its layers and residues. Among the ruins of the building are certain arrangements and accommodations of pieces that can recall different traditions or moments within the history of the museums and their forms of display. 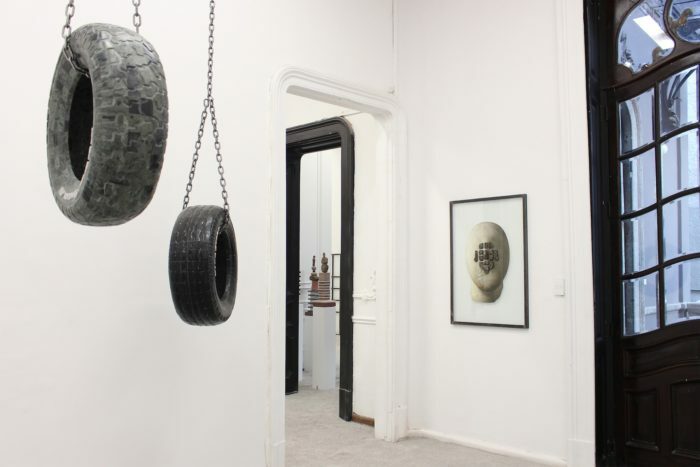 In the first room, entering the gallery, there is a series of conventional white bases. 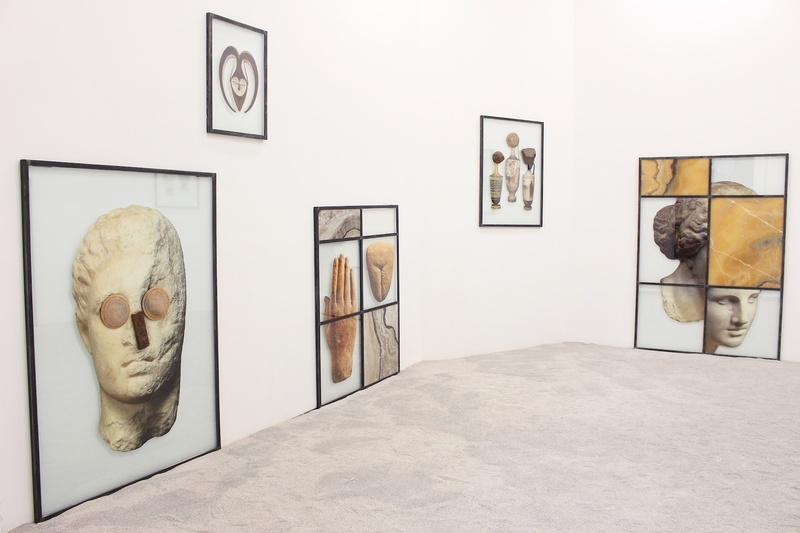 On display are a set of rock sculptures made by Mercier, pieces, and fragments of ceramics, different types of building bricks and reproductions of archaeological objects sold in different markets as if they were authentic. 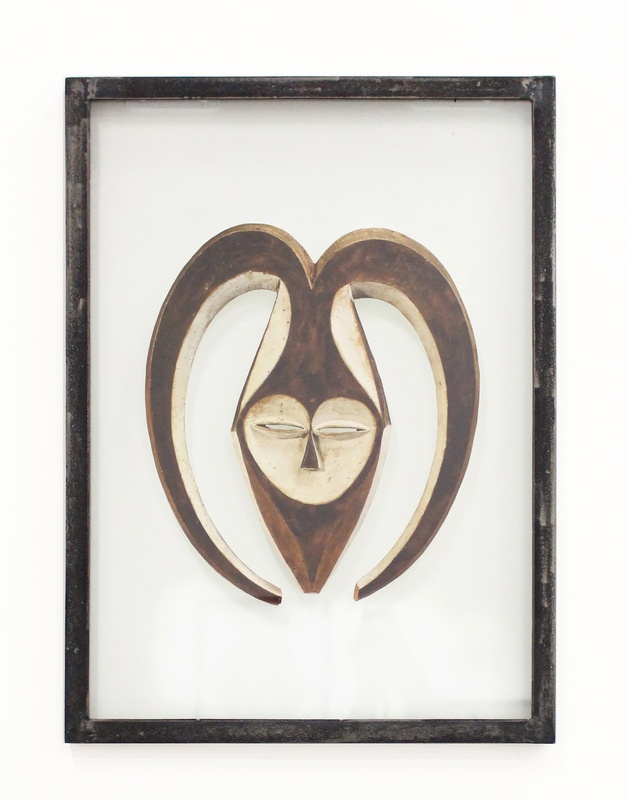 Each piece is a mixture of purchased or acquired items, natural or handcrafted. 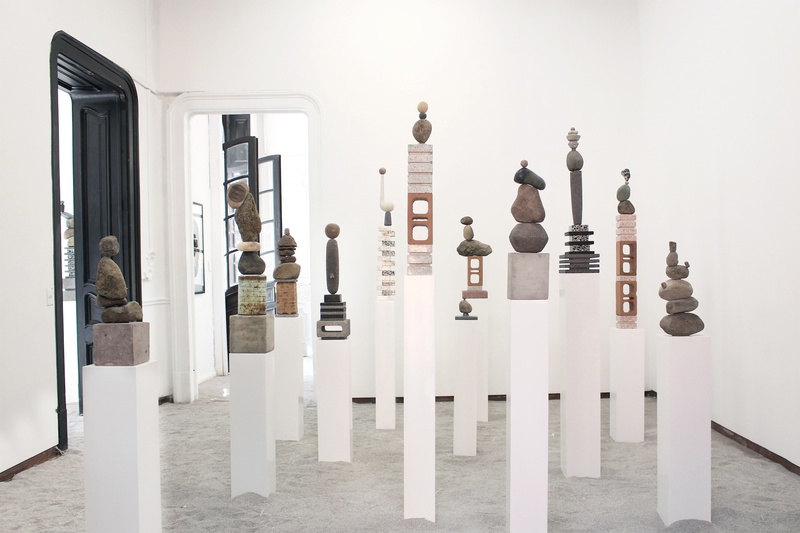 Characterized by a tendency towards verticality, this group of sculptures —each with different heights— articulates a kind of urban aspect, as if it was a landscape with towers that refers to the space of the city where the majority of these items were found. This monolith room with rubble-filled floor can easily bring to mind the arrangement of pieces inside an archaeological museum or dedicated to anthropology. 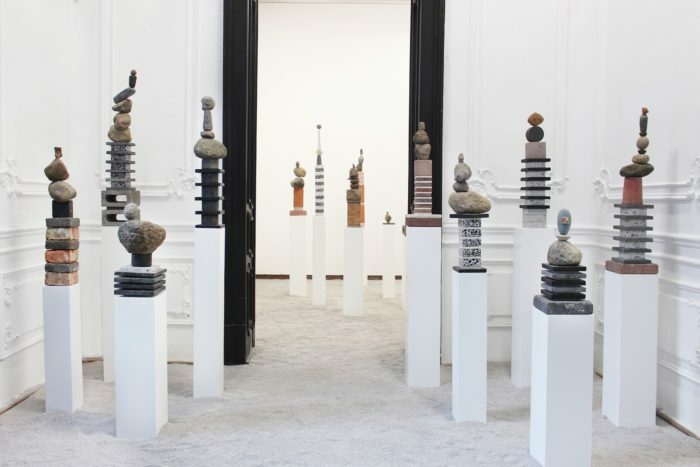 The materials that Mercier has selected for the production of this set of sculptures have an archaic appearance, reminiscent of pre-Hispanic or Cycladic works of art to which he has referred in previous projects. This aspect is preserved even though it is evident that some of the elements that compose them, such as the bricks, are of contemporary production. Thus, in these works, different temporalities seem to collapse into an object of ancient appearance. 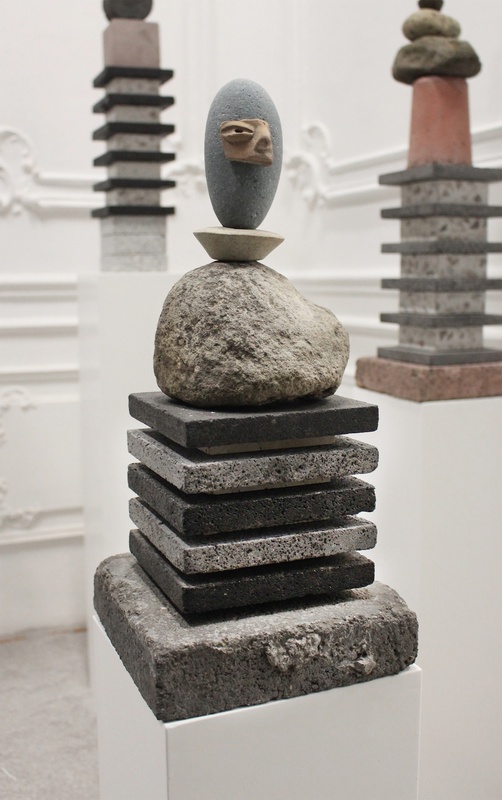 Mercier has lifted each sculpture from an assembly of objects that moves vertically as if they were menhirs or totems. 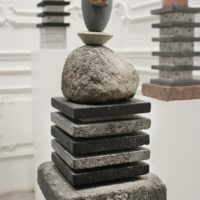 The pieces tend to manifest a kind of precarious balance as if they could be totally demolished with a sudden movement or the slightest impact. 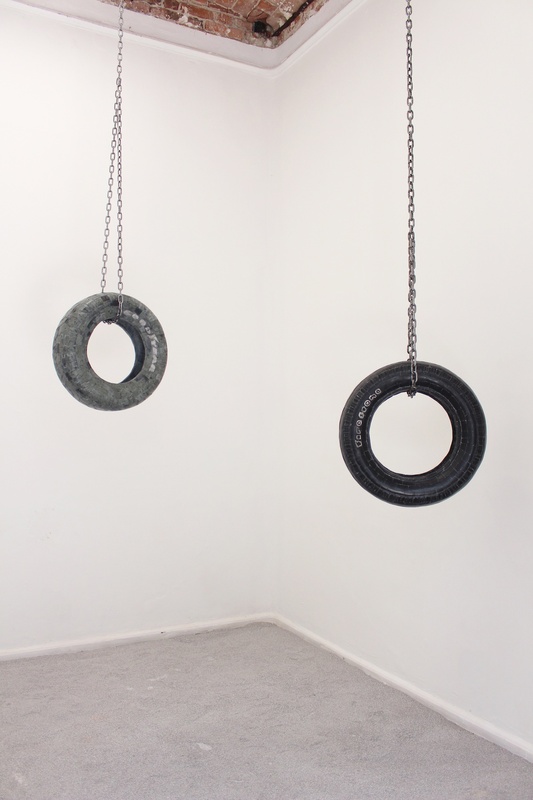 Here, the artist resorts to a contemporary sculptural solution that merges, again, into the archaic appearance of the pieces. This record, in which the old collapses with the current, keeps a commentary present on the work of the artist about the construction of history. With its emphasis on the precarious balance of the pieces, which simultaneously deals with the facility of that construction to be destroyed or crumbled down into pieces. 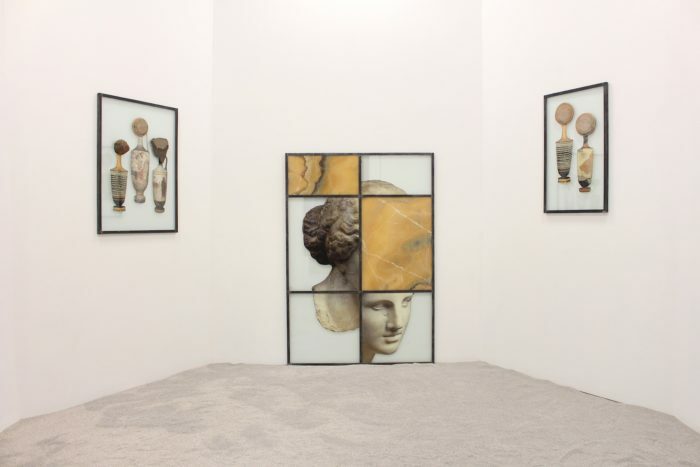 In each sculpture, in particular, Mercier operates a similar strategy in which different temporalities seem to be synthesized in a single time, thus questioning the languages associated to the ancient, the modern and the contemporary as well as to art and archeology. Each piece is highly suggestive in this regard. 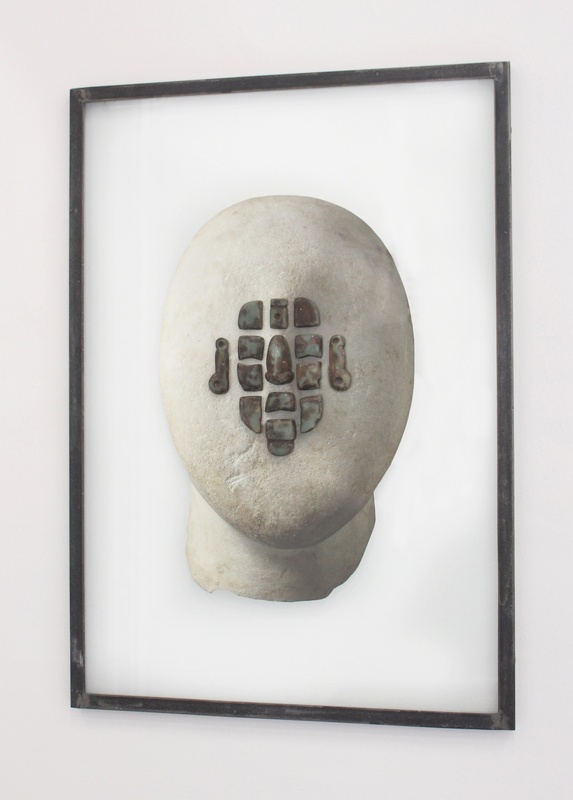 Occasionally, the works have obvious anthropomorphic references such as the incorporation of a false prehispanic mask or the indication of parts of the body through the use of rocks or other elements. Other works may refer to modern art solutions —evoking some examples of the production of Joan Miró, Hans Arp or Alexander Calder— or they may also resemble the most popular forms and assemblies of postmodern design emblematized in the work of the Memphis Milano group. In all these cases, Mercier takes advantage and works with the suggestive forms of some of the materials used, such as stones. By grouping them in a certain way, they may appear to be sophisticated jars or containers, and even to articulate certain types of scenes, as in the case of Archaic Suicide, a sculpture in which it seems that an anthropomorphic form is on the edge of the highest point of a mineral structure facing the cliff. 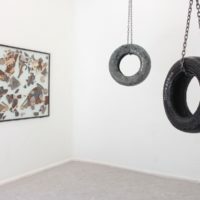 The limit of the balance present in this piece is consonant with the stability that is at stake in the totality of the pieces that occupy this first room. 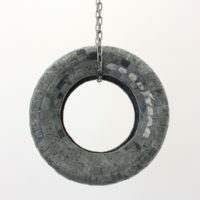 In other parts of the rooms that Phantom Legacy occupies, Mercier has arranged a pair of Good-Year and Firestone tires coated with different minerals, such as obsidian. 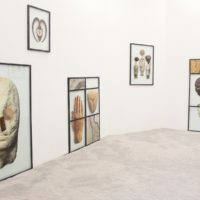 For the elaboration of these pieces, the artist worked with a person dedicated to the production of false prehispanic objects that are sold assiduously in Mexico City markets. 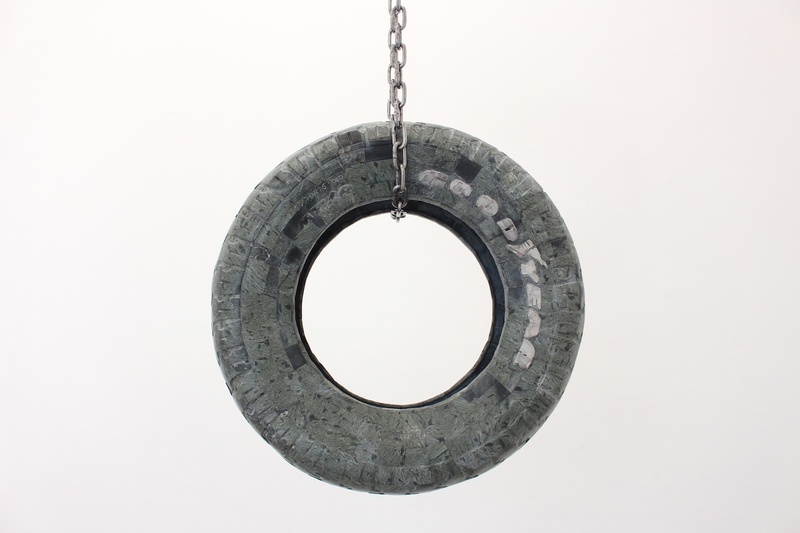 The rims have a coating made with fragments of stone in the manner of certain pieces of pre-Columbian art, such as the mask of the Aztec god, Tezcatlipoca, which is part of the British Museum collection and consisting of a skull covered with pieces of turquoise, lignite and red shell. 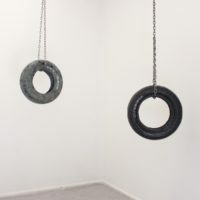 Again, Mercier collapses different temporalities in these pieces, as well as processes of industrial production with methods of artisan production. If these parts were devoid of the brands names of the companies that manufacture the tires, they could very easily refer to certain pre-Hispanic objects and compare, for example, to the ball game’s score rings. The presence of the names of the brands, however, also leads to give other meanings to the pieces. When these names are translated from English, they become objects that announce good omens or even point out mystical objects, such as the stone of fire. 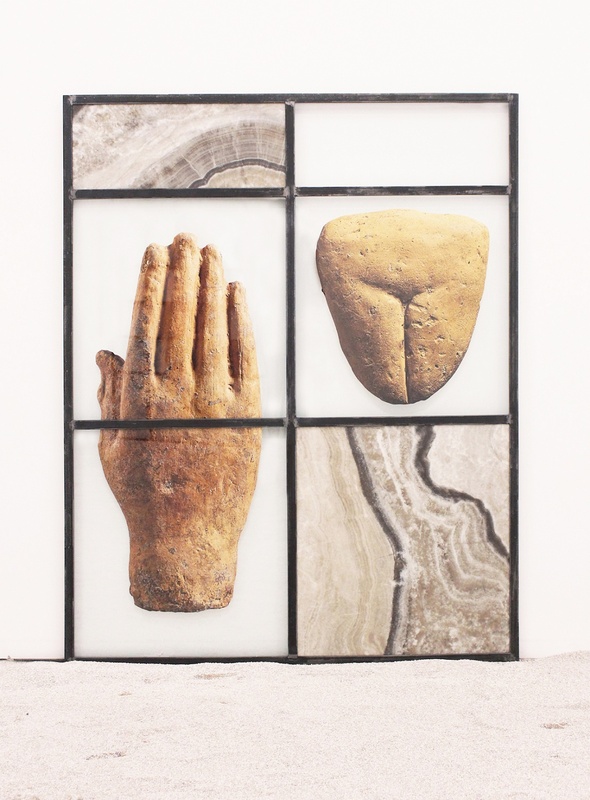 In another room of the gallery, Mercier has arranged a series of two-dimensional works made with window metalwork and images from the magazine Chefs-d’oeuvre de l’art published in France in the 1960s, together with different stones and minerals. The artist had already resorted to these images in previous projects (Chefs-d’oeuvre de l’art, 2016). On this occasion, there is a variation. Originally the photographs of these pieces, designated as masterpieces of universal art according to the publication, were printed on solid colored backgrounds, something that the artist related to the prevailing pop aesthetics during those years. 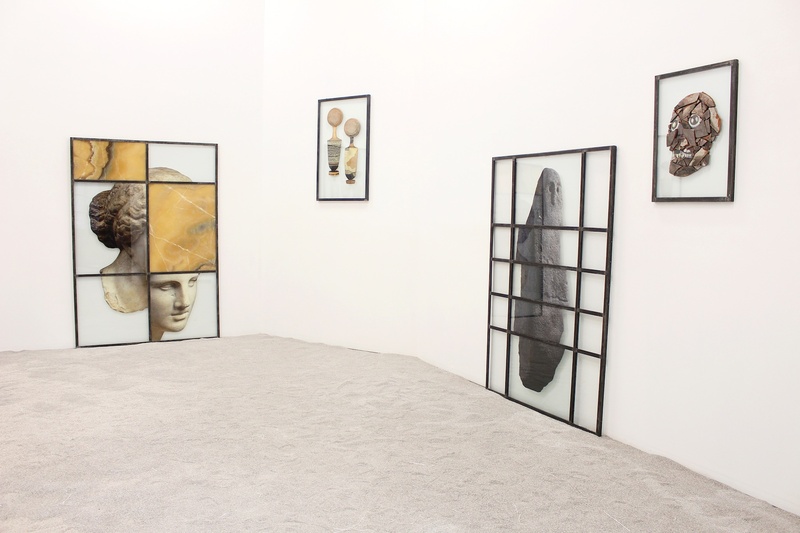 For these new pieces, he has trimmed the works in order to eliminate the background and mounted them between two glasses. 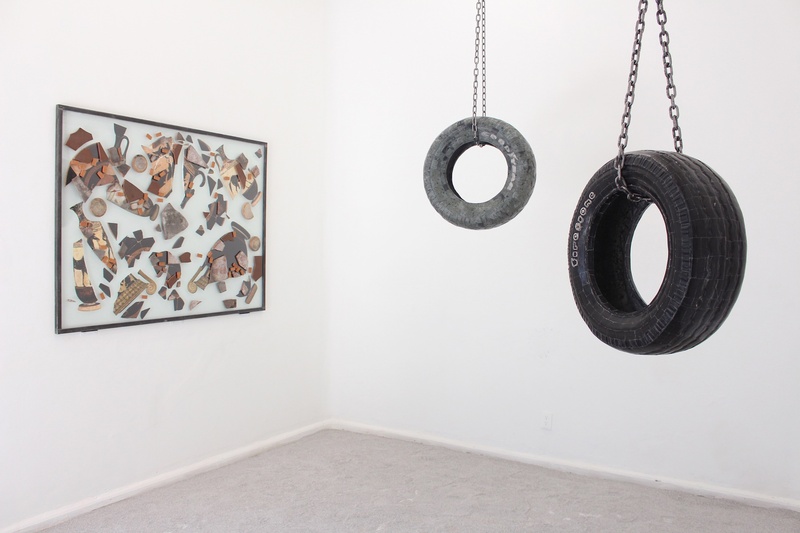 The new solution rescues the sculptural nature of the photographed pieces. This quality is emphasized with the incorporation of fragments of tiles and stones on the glass, in consonance with the materiality of the images. 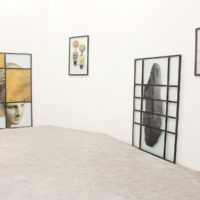 The strength of these elements contrasts with the fragility of the glass and articulates a set of layers on the piece that resonates with the display strategy used by Mercier to cover the floor of the gallery with the debris of its walls and ceiling. If the first room of Phantom Legacy could refer to a room of monoliths inside an anthropological or archaeological museum, this space that presents these two-dimensional pieces emulates a kind of painting hall through its hanging. Whereas the works he did in 2016 from the magazine Chefs-d’oeuvre de l’art resonated with the aesthetics of pop, this time the new works can be associated with certain solutions close to neoplasticism. The metalwork of the windows used as frames and supports, obviously, plays a crucial role in this when conforming, sometimes, geometric reticles. Beyond this reference to the history of avant-garde painting there is an evident relationship with architecture and in particular with modern Mexican architecture. Mercier includes different minerals, among them alabaster, like elements that occupy segments of the reticule traced by the metalwork. In addition to the pictorial qualities that this type of materials can bring to the pieces, this solution recalls some gestures of modern Mexican architecture. An example would be the Central Library of Ciudad Universitaria (1953), in which Juan O’Gorman used alabaster as a highly ornamental element. Mercier’s work can be related to this work of the Mexican architect in which, although he sought to formulate a new architecture, he did not fail to revisit the past and history as constituent parts of the present. Undoubtedly, the metalwork of the windows hung in this space contributes to the ruined appearance of the gallery as a whole, which, as a great installation, Mercier has used to give unity to Phantom Legacy—as if they were parts of the house that also have been dismantled. 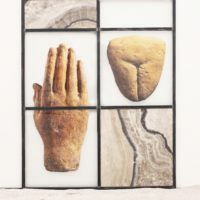 In this project, the fragment and its conception of ruin are used to create sculptures, two-dimensional works, three-dimensional collages emulating different forms or traditions of exhibition within the history of museums and galleries. 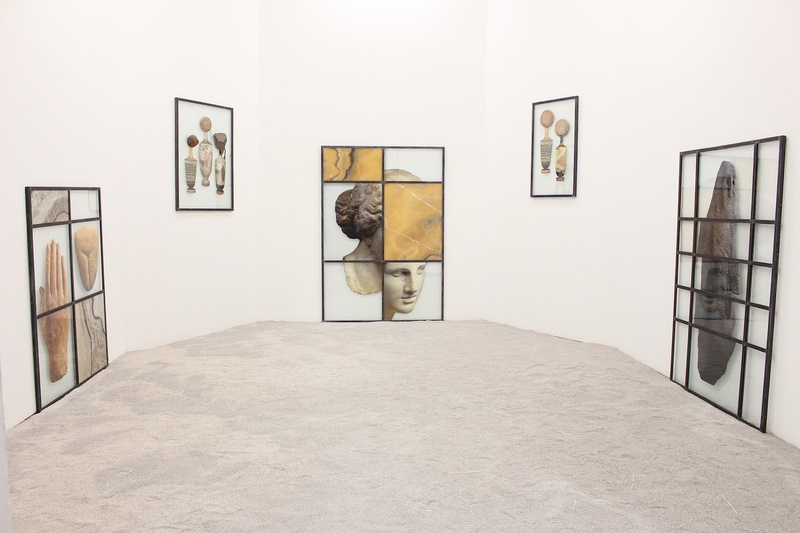 Mercier’s work uses them to demonstrate a kind of artificiality at play in the construction of history and, simultaneously, to point out the fragility of it. In the same way, in the pieces and the backgrounds that comprise Phantom Legacy, different temporalities collapse in a single time questioning what is understood by contemporary or current, emphasizing the presence and interference of the past in the everyday. It is worth mentioning that these comments have the peculiarity of being marked by a particular humor, visible in pieces like Archaic Suicide and even in the title of this show. 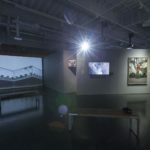 A humor that questions conventional expectations, in this case, of the gallery space, the history, past and present. All of this here seen through humor emanates and explodes. Para el proyecto Legado Fantasma, Théo Mercier ha decidido derribar los viejos muros y techos de las salas de exhibición de la galería MARSO. Los escombros se encuentran en el piso a la manera de una ruina. Hay algo de la historia del lugar que se desploma con este acto. Los restos de la superficie arquitectónica del interior se incorporan, así, a la exposición. Mercier, quien también cuenta con una producción en el terreno de las artes escénicas, entiende bien el valor que pueden tener ciertos recursos escenográficos. En este caso, los escombros – vistos como ruinas o una especie de estrato – entablan un diálogo con las piezas que integran Legado Fantasma, mismas que tocan temas relacionados con la historia, la antropología, su construcción y destrucción, así como sus capas y residuos. Entre las ruinas de la construcción se levantan ciertos arreglos y acomodos de piezas que pueden recordar distintas tradiciones o momentos dentro de la historia de los museos y sus formas de display. En la primera sala, al entrar a la galería, se encuentran una serie de bases convencionales de color blanco. Sobre ellas, están dispuestas un conjunto de esculturas elaboradas por Mercier a partir de rocas, piezas y fragmentos de cerámica, distintos tipos de ladrillos para construcción, así como reproducciones de objetos arqueológicos que se venden en distintos mercados como si fueran auténticos. Cada pieza es una mezcla de objetos comprados o adquiridos, naturales o fabricados por el hombre. 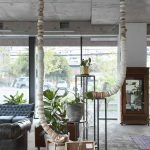 Caracterizado por una tendencia hacia la verticalidad, este grupo de esculturas – cada una con distintas alturas – articula una especie de semblante urbano, como si fuese un paisaje con torres, que remite al espacio de la ciudad donde fueron encontrados y adquiridos la gran mayoría de estos objetos. Esta sala de monolitos, con el piso lleno de escombro, puede traer a la mente con facilidad el arreglo de piezas dentro de un museo arqueológico o dedicado a la antropología. Los materiales que Mercier ha seleccionado para la producción de este conjunto de esculturas cuentan con una apariencia que las hace ver arcaicas, reminiscentes de las obras de arte prehispánico o cicládico a las que ha hecho referencia en proyectos anteriores. Este aspecto se conserva aún cuando es evidente que algunos de los elementos que las componen, como los ladrillos, son de producción contemporánea. Es así que en estas obras distintas temporalidades parecen colapsarse en un objeto de apariencia antigua. Mercier ha levantado cada escultura a partir de un ensamble de objetos que se mueve verticalmente, como si fueran menhires o tótems. Las piezas tienden a manifestar una especie de balance precario, como si pudieran ser derribadas en su totalidad con un movimiento brusco o el más mínimo impacto. Aquí, el artista recurre a una solución escultórica contemporánea que se funde, de nueva cuenta, en la apariencia arcaica de las piezas. Este registro, en el que se colapsa lo antiguo con lo actual, guarda un comentario presente en la obra del artista sobre la construcción de la historia. 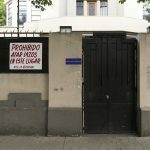 Con su énfasis en el balance precario de las piezas, simultáneamente, aborda la facilidad de la destrucción o desmoronamiento de dicha construcción. 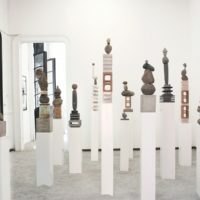 En cada escultura en particular, Mercier opera una estrategia similar en la que distintas temporalidades parecen sintetizarse en un solo tiempo, cuestionando así los lenguajes asociados a lo antiguo, lo moderno y lo contemporáneo, así como al arte y la arqueología. Cada pieza es altamente sugerente en este sentido. En ocasiones, las obras cuentan con referencias antropomórficas evidentes como pueden ser la incorporación de una mascarilla falsa prehispánica o la indicación de partes del cuerpo a través del uso de rocas u otros elementos. 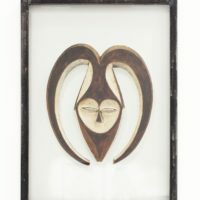 Otras obras pueden remitir a soluciones del arte moderno – evocando algunos ejemplos de la producción de Joan Miró, Hans Arp o Alexander Calder – o también pueden asemejarse a las formas y ensambles más populares del diseño posmoderno emblematizado en el trabajo del grupo Memphis Milano. En todos estos casos, Mercier aprovecha y trabaja con las formas sugerentes de algunos de los materiales que utiliza, como son las piedras. Al agruparlas de cierta manera pueden parecer sofisticados frascos o recipientes e inclusive, articular cierto tipo de escenas como sucede en el caso de Archaic Suicide, una escultura en la que pareciera que una forma de aspecto antropomórfico se encuentra en el borde del punto más alto de una estructura mineral, enfrentándose al precipicio. El límite del balance presente en esta pieza es consonante con la estabilidad que está en juego en la totalidad de las piezas que ocupan esta primera sala. En otros puntos de las salas que ocupa Legado Fantasma, Mercier ha dispuesto un par de llantas de las marcas Good-Year y Firestone recubiertas de distintos minerales, como obsidiana. Para la elaboración de estas piezas, el artista trabajó con una persona dedicada a la producción de falsos prehispánicos que son vendidos asiduamente en mercados de la Ciudad de México. Las llantas cuentan con un recubrimiento hecho con fragmentos de piedra a la manera de ciertas piezas de arte precolombino, como la máscara del dios azteca Tezcatlipoca que es parte de la colección del British Museum y que consta de un cráneo cubierto con pedazos de turquesa, lignito y concha de color rojo. De nueva cuenta, Mercier colapsa distintas temporalidades en estas piezas, pero también procesos de producción industrial con métodos de producción artesanal. Si estas piezas estuvieran desprovistas de los nombres de las marcas de las compañías que manufacturan las llantas podrían remitir con gran facilidad a ciertos objetos prehispánicos y compararse, por ejemplo, con los anillos de anotación del juego de pelota. La presencia de los nombres de las marcas, no obstante, también se presta para dar otros significados a las piezas. Al traducirlos del inglés se vuelven objetos que anuncian buenos presagios o inclusive señalar objetos místicos, como sería la piedra de fuego. En otra sala de la galería, Mercier ha dispuesto una serie de obras bidimensionales hechas con herrería de ventanas, imágenes provenientes de la revista Chefs-d´oeuvre de l´art publicada en Francia en la década de 1960 y distintas piedras y minerales. El artista ya había recurrido a estas imágenes en proyectos anteriores (Chefs-d´oeuvre de l´art, 2016). 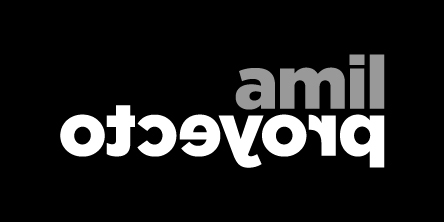 En esta ocasión, existe una variación. Originalmente las fotografías de estas piezas, señaladas como obras maestras del arte universal de acuerdo a la publicación, fueron impresas sobre fondos de colores sólidos, algo que el artista relacionaba con la estética pop imperante durante esos años. Para estos nuevos trabajos, ha recortado las obras con el fin de eliminar el fondo y las ha montado entre dos vidrios. La nueva solución rescata el carácter escultórico de las piezas fotografiadas. Esta cualidad es enfatizada con la incorporación de fragmentos de losetas y piedras sobre el cristal, en consonancia con la materialidad de las imágenes. La solidez de estos elementos contrasta con la fragilidad del cristal y articula un juego de capas o estratos sobre la pieza que resuena con la estrategia de display utilizada por Mercier de cubrir el suelo de la galería con los escombros de sus paredes y el techo. Si la primera sala de Legado Fantasma podía referir a una sala de monolitos dentro de un museo antropológico o arqueológico, este espacio que presenta estas piezas bidimensionales emula una especie de salón de pintura a través de su colgado. 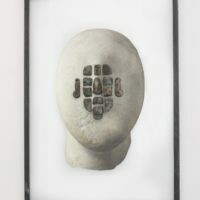 Mientras que las obras que realizó en el 2016 a partir de la revista Chefs-d´oeuvre de l´art resonaban con la estética del pop, en esta ocasión los nuevos trabajos pueden asociarse con ciertas soluciones cercanas al neoplasticismo. La herrería de las ventanas que utiliza como marcos y soportes, obviamente, juega un papel crucial en esto al conformar, en ocasiones, retículas geométricas. Más allá de esta referencia a la historia de la pintura de vanguardia existe una relación evidente con la arquitectura y en particular, con la arquitectura moderna mexicana. Mercier incluye distintos minerales, entre ellos el alabastro, como elementos que ocupan segmentos de la retícula trazada por la herrería. Además de las cualidades pictóricas que este tipo de materiales pueden aportar a las piezas, dicha solución recuerda algunos gestos de la arquitectura moderna mexicana. Un ejemplo sería la Biblioteca Central de Ciudad Universitaria (1953), en la que Juan O´Gorman utilizó alabastro como un elemento altamente ornamental. El trabajo de Mercier, puede relacionarse con esta obra del arquitecto mexicano en la que, aunque buscaba formular una nueva arquitectura, no dejaba de revisitar el pasado y la historia como partes constitutivas del presente. Sin duda, la herrería de las ventanas colgadas en este espacio contribuye a la apariencia de ruina de la galería en su totalidad que, como una gran instalación, Mercier ha utilizado para dar unidad a Legado Fantasma – como si fueran partes de la casa que también han sido desmontadas. 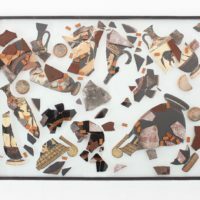 A través de este proyecto, el fragmento y su concepción como ruina, son utilizados para crear esculturas, obras bidimensionales, collages tridimensionales y emular distintas formas o tradiciones de exhibición dentro de la historia de los museos y las galerías. El trabajo de Mercier los emplea para demostrar una especie de artificialidad en juego en la construcción de la historia y, simultáneamente, para señalar la fragilidad de la misma. Del mismo modo, en las piezas y el ambiente que conforman Legado Fantasma distintas temporalidades se colapsan en un solo tiempo, cuestionando lo que se entiende por actual o contemporáneo y subrayando la presencia e injerencia del pasado en el presente cotidiano. Vale la pena mencionar que estos comentarios cuentan con la particularidad de estar marcados por un particular humor, apreciable en piezas como Archaic Suicide e incluso en el título de esta muestra. Un humor que pone en entredicho las expectativas convencionales, en este caso, del espacio de una galería, de la historia, el pasado y el presente. Aquí todo esto, visto a través del humor, emana y explota.